XS (S, M, L, XL). Shown in size XS. 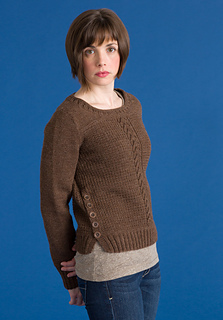 A broken rib stitch pullover with center eyelet panel and side body buttons. Circular knitting needle (24” or 32”) and one double pointed needle (dpn) in size US 4 (3.5 mm) or size to obtain gauge. 25 sts and 37 rows = 4” in Broken Rib using larger needles; 25 sts and 35 rows = 4” in St st using larger needles; 13 sts of Arrow Panel meas approx 2” wide using larger needles. Take time to save time, check your gauge. The lower back and front are worked separately for the length of the side openings, then joined for working in the round to the armholes. 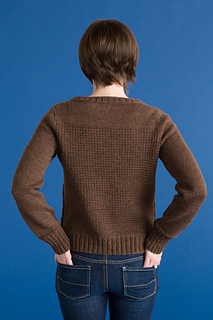 Above the armholes, the back and front divide again and are worked separately to the shoulders.